I work with many clients to sort their paperwork. I love it! I love to corral the papers from every nook and cranny of the house and then whip it into shape. How we sort it is dependant on the client (and that’s a topic for a blog another day), but the first thing I do with any client is ask, why do you need to keep it at all? Take a look here, it really is helpful! With the information in the above link in mind you do not need keep utility bills once they have been paid, unless you work from home (and claim a portion of your bills on your tax), or the utility bills are related to an investment property. So have a good think about getting rid of the paper copy of your utility bills the next time you pay it. If you’re in doubt, check with your accountant as to what you need to keep for your specific circumstances. I’ve talked a lot about processing kids school/artwork on spaceandtime.com.au. Much of what I talk about is regular processing (daily, end of term and end of year) and keeping paper copies of 2 or 3 of the VERY BEST pieces for the year. I see that it’s important to get the kids involved and teach them how to decide what to keep and what to let go. Set some boundaries for them (such as how much they can keep, and how long) to ensure they don’t keep everything. Check out Archiving kids art/school work and Managing the influx of school work for more details. 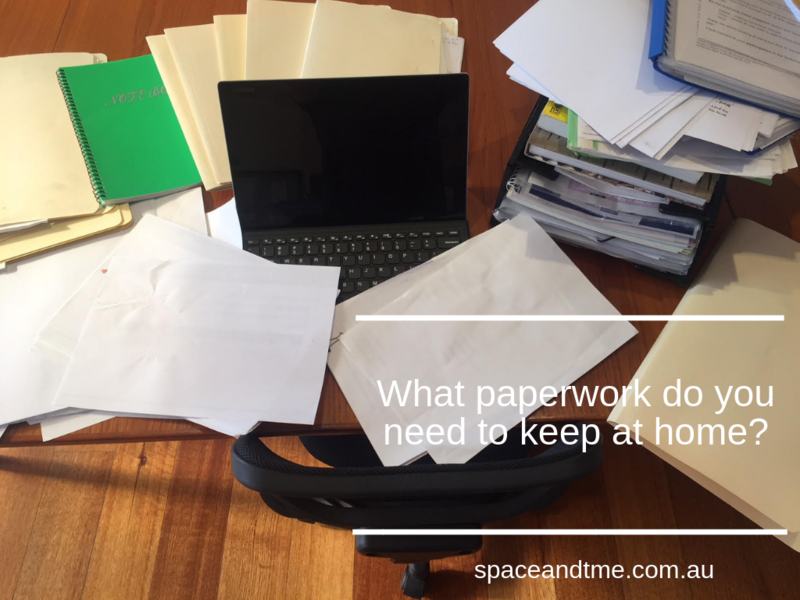 You may also have specialist documents you keep at home for your work (or previous work). Teachers are very attached to the resources they’ve lovingly created over the years and find it difficult to let them go. Many of us are also very attached to personal University work too; Oh, the blood sweat and tears that went into each project! Can I access something similar online from someone else? Can I store my copies online and let go of the paper copies? Which small collection of notes can I take a photo of and display in your office as a memento? Many of my clients have lots of ongoing medical issues, so they have a stack of medical paperwork. Having worked at Melbourne Storm Rugby League Club for 10 years as paying the players medical bills, I love this stuff! Processing medical paperwork is much the same as processing the kids school/artwork. It needs to be done regularly. Has it been claimed from Medicare and/or Health insurer. Do you need to keep a copy for future reference? Keep the documents you need in chronological order, by patient and by specialist Doctor. Personally, I do not keep copies of medical records/receipts etc once they have been claimed from Medicare as I do not need to access the information again. Asking yourself why you need to keep the paperwork at all is a great starting point to taking control of your paperwork. The links to the ATO website and my previous blogs will also give you some guidelines as to how to process incoming paperwork and what you legally need to keep. If you really can’t get your head around all this, give me a call to discuss your challenges. I’d be happy to give you some guidance over the phone or email. If you’re still stuck after a chat, I can come and work in your home and sort it all out for you.